The ongoing debate about whether to create a formal power market in the Western US has heated up again, with legislation in California. Next10, the California think tank, asked PaulosAnalysis to make sense of the debate and provide objective analysis for policymakers. The report, A Regional Power Market for the West: Risks and Benefits, was released on July 17. A companion report, Transforming the Grid: An Introduction to California’s Electric System in the 21st Century, gives a basic overview of the California power system, policies, and opportunities. A third report, The Growth of Distributed Energy: Implications for California’s Grid, covers the opportunities and policy needs for distributed energy. The new community choice aggregation program for Alameda County, East Bay Clean Energy, is phasing in operations in 2018. PaulosAnalysis handles communications to energy stakeholders, including writing the newsletter and blog “From the CEO’s Desk,” and op-eds. We also worked with the staff to develop a successful funding proposal to the Bay Area Air Quality Management District (BAAQMD) to look at putting solar and storage systems on critical facilities like fire and police stations. EBCE will partner with Peninsula Clean Energy on the project. The Illinois Legislature passed the Future Energy Jobs Act in late 2016, which, among other things, created a new effort to encourage distributed solar power in the state. The Illinois Power Agency was tasked with setting up an incentive program for rooftop, community, and low-income solar projects. PaulosAnalysis helped design the programs and policies, and provided input to the draft Long-Term Renewable Resource Procurement Plan (LTRRPP, pronounced “let ‘er rip!”). The US Department of Energy’s Sunshot initiative is supporting over 170 teams around the country to pursue solar projects that benefit low-income communities and non-profits, and explore new deployment models, like community solar. The competition offers technical support, seed funding, and cash prizes to the top projects. PaulosAnalysis is serving as a Coach for 10 teams participating in the Challenge, and wrote a series of 10 articles publicizing various teams. The Institute for Sustainable Communities is a global NGO that gives “passionate, committed people the tools and skills they need to inspire active citizenship, protect the environment, and take on climate change.” PaulosAnalysis first worked with ISC on their conference, The Future Is Now: India, in Hyderabad, India, presenting the American experience on integrating renewable energy and the potential for energy storage. We then pitched in on a Sustainable Communities Leadership Academy, bringing a dozen city and county teams together to explore clean energy strategies at the local level. Most recently, we helped summarize and promote the Solar Market Pathways initiative, which they managed on behalf of the DOE Solar Energy Technologies Office. The Clean Energy States Alliance (CESA) is a national, nonprofit coalition of public agencies and organizations working together to advance clean energy. CESA members—mostly state agencies— include many of the most innovative, successful, and influential public funders of clean energy initiatives in the country. CESA members are interested in improving their policies to extend the benefits of solar power to low and moderate income consumers. PaulosAnalysis developed a policy guide that reviews current best practices, innovative ideas, and makes recommendations for future policy and program action. The Green Ribbon Commission is a group of business, institutional, and civic leaders in Boston working to develop shared strategies for fighting climate change in coordination with the City’s Climate Action Plan. 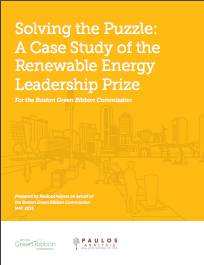 With funding from the Barr Foundation, the GRC offered the Renewable Energy Leadership Prize, to spur innovative approaches for large-scale adoption of renewable energy, demonstrating the Greater Boston area’s appetite for and readiness to lead the way toward a clean, sustainable energy future. They hired PaulosAnalysis to document the process and write a case study with lessons learned for future procurement efforts. The findings were presented in October 2016 at the Renewable Energy Markets 2016 conference in San Francisco. The Electricity Markets and Policy Group (EMP) at the Berkeley Lab is one of the premiere sources of deep thinking about our energy future, hosting some of the nation’s leading experts on energy efficiency and renewable energy. PaulosAnalysis is helping EMP improve their communication strategies, exploring new methods of outreach to the public and the press. A special focus is the Future Electric Utility Regulation (FEUR) project, a series of in-depth studies on the implications of distributed energy resources for utility regulation and planning. PA Consulting, a utility consulting firm with offices in New York and London, asked Greentech Media for help in promoting their US presence. GTM asked PaulosAnalysis to help craft a series of white papers and articles about PA’s thinking and expertise on Dynamic Energy, their term for the future paradigm of utility operations in a highly-intelligent and distributed world. Reports, articles, videos, and more are here. But many utilities are dragging their feet, or actively impeding progress. People who want to save energy or install solar panels are finding their efforts at odds with utilities seeking to preserve their profits. Seeing an existential threat to their business model, utilities across the country are pursuing policy changes that will make it less viable for customers to generate their own electricity. Impatient with the slow pace of change, an increasing number of cities are taking matters into their own hands as their citizens seek energy that is local, affordable, and clean. 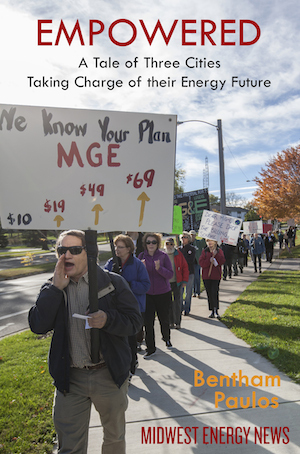 Published by Midwest Energy News, it can be ordered in paperback from Lulu or e-book from Amazon. Media coverage from a Wisconsin book tour is posted here. If you would like me to speak about the book at your conference, webinar, or other event, please contact me. PaulosAnalysis provides strategic development, progress evaluation, and other services for foundation and NGO clients in the energy and environment space. Clients have included the Barr Foundation, the Energy Foundation, Fresh Energy, Agora Energiewende, the Governors’ Wind Energy Coalition, and the Climate & Energy Project. The academic discussion of what the utility of the future will look like is turning to implementation, as state policymakers begin to grapple with the technical, financial and regulatory implications of grid-edge technologies. Some states are being driven by the opportunity that grid-edge technologies can offer: lower costs, higher reliability, lower emissions, and economic opportunity for in-state industries. Other states are being driven by pressure: technological, financial, and political pressure—conditions that threaten a state’s economy, power reliability, and potentially even the safety of its citizens. Grid-edge technologies can offer a solution to these pressures. New technologies can also create their own pressures, as they are adopted by consumers outside the control of utilities and regulators, threatening traditional business models and operations. PaulosAnalysis was commissioned by GTM Research to write Regulating the Utility of the Future, a report that looks at what five leading states – California, Hawaii, Massachusetts, Minnesota, and New York – are doing to respond to these opportunities and pressures in order to create the utility of the future through regulatory proceedings. As renewable energy becomes cost competitive and technologically mature, two sets of problems must be resolved for it to be a significant contributor to our energy supply: 1) the technical issues of how power flows on the grid, and 2) the financial issues of how money flows in electricity markets. Because the technical issues of integrating wind and solar power are well in hand by grid operators, the Power Markets Project addresses the latter issue. With a focus on markets in the US and Germany, it considers reforms to wholesale electricity markets to accommodate the rapid growth of renewables. The Project summarizes the existing debate and literature on electricity market issues in both countries. It then brought a delegation of German policy-makers and grid experts to the United States to learn about experience with capacity and energy-only markets. As part of the visit to Texas, the UT Energy Institute convened a symposium on the theme of “Germany & Texas: Energy Twins?” Lastly, it publicizes the findings of the research and the tour, to promote further understanding about the issues. I was the project designer, principal researcher, and tour guide. Funding came from the Heinrich Böll Foundation, the Cynthia and George Mitchell Foundation, and the Rockefeller Brothers Fund. America’s Power Plan is a policy roadmap for dealing with rapid change in the power sector on the way to a clean energy future. The project was designed to provide a vehicle for policymakers at the state and local levels to address policy challenges. At the heart of the project are detailed recommendations from leading experts for improving policies in seven key areas: power markets, utility business models, finance policy, distributed energy resources, distributed generation policy, transmission policy and siting of new power infrastructure. More than 150 energy experts from academia, industry and non-profits participated in the project. I was the project designer and funder, while at the Energy Foundation, and the project manager, promoter, and chief spokesperson afterwards. It was a collaborative project with Energy Innovation and funded by the Climateworks Foundation. Read more at America’s Power Plan.com.